﻿ 2018 W&S Thanksgiving Day 10K Run & Walk Newsletter #6 - RUN that by ME - Who could ask for anything more? We Run on Love, Laughter and a Whole Lot of COFFEE! What goes best with a cup of coffee? A great Thanksgiving Day Run! That's why for the first time ever, we are serving 14,000 cups of coffee at the start of this year's race. "We believe that coffee with your running friends is like capturing happiness in a cup," said Gary Weber, Jr., CEO of Wallingford Coffee & Tea, who will be pouring the happiness! Speaking of happiness and hot coffee, we are still having a hot sale on registration for you and the family, and 40 percent off our new, high-tech quarter zip pullover! We hope you and your friends will grab a cup or two together. We believe that it will keep you going to that finish line much faster. Be beautiful. Be healthy. 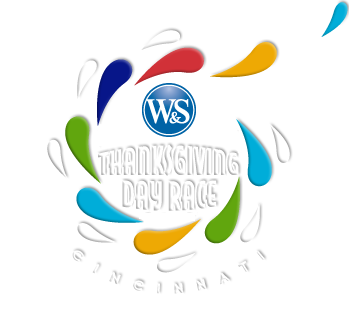 Be there, Cincinnati, for what Men's Health Journal says is "one of the best Turkey Trots in America." Why is it totally okay that you love your coffee? According to John Cameron, Sales Director for Wallingford Coffee & Tea, here are five research-backed reasons to love coffee. There are more than 1,000 chemical compounds in coffee, many of which likely harbor anti-inflammatory and anti-cancer properties. Recent studies show that more than two-thirds of Olympic athletes use caffeine to improve their running performance. "You can be quite sure that if Olympic athletes are using caffeine before they run, it works," said Cameron. "However, you don't need to be an Olympic caliber runner to benefit from the strategic use of caffeine." Over the past decade, studies have found a link between coffee consumption and a lower risk of dementia. "It's thought that the drink's high caffeine content might be responsible for the brain-boosting benefits," said the specialists at Wallingford, who are celebrating 100 years in the coffee business. According to the BMJ review, people who drink coffee are 19 percent less likely to die of cardiovascular disease and 30 percent less likely to die of stroke than their coffee-abstaining counterparts. That was the conclusion of a 2016 review in the European Journal of Epidemiology, which found that drinking four cups of coffee a day was associated with a lower risk of mortality, including death from heart disease and cancer. If you're new to running, should you focus on getting faster or going longer? "Being able to run farther offers more long-term health benefits than being able to run fast," said TriHealth physical medicine specialist Shrishail Nashi, M.D. "As you increase your mileage, you build stamina and endurance and teach your body to burn fat effectively." In addition, the extra miles do more than trim your waistline. "Those who regularly burn more calories are at a lower risk for heart disease, diabetes, high blood pressure and more." What things are bad for your brain? "The cumulative effect of consistently getting six or fewer hours of sleep seriously impairs cognitive functioning and response speed," said Dr. Steve King, chiropractor and nutritionist from Mt. Lookout Chiropractic. "Although your brain needs glucose to function, too much has been shown to have detrimental effects on the brain," said Dr. King. "You think you are doing two or more tasks at the same time, but your brain is actually switching rapidly from one task to the other," said King. "Multitasking reduces creativity, increases errors, lowers your ability to focus on the important stuff and increases problems with sleep, stress, and memory," said Dr. King. What are some major productivity killers? "Your time is finite," said John Barrett, CEO of Western & Southern. "When you choose to say yes to that sixth meeting of the day, to review work for a colleague, or to accept another assignment, you're sacrificing the quality time you need to work on your highest priorities." There are far more distractions at work today than there were a few years ago. "It takes an average of 25 minutes to resume your work after an interruption," said Alvin Roehr, CEO of The Roehr Agency. "If you allow multiple small distractions — internet news, sports and social media — to occur, imagine all the time you could have spent getting things done." "Most to-do lists include high-impact activities — those we know will help propel us toward our goals and deliver solid returns," said Barrett. "However, the reality is that our daily work also includes things that aren't as impactful. The small things still need attention, but putting them first can make us less productive." When you chase your dreams, you won't catch them all at once.